With a population of 120,000 people, Olathe, Kansas is one of the fastest growing communities in the country. Olathe has some of the highest ranked schools in Kansas and Money magazine recently ranked Olathe #11 on its list of the "100 Best Cities to Live in the United States." This guide to Olathe restaurants and tourist attractions has my candid comments and recommendations for things to do and places to dine in Olathe. I am a 23 resident of Johnson County, and have worked in Olathe for the past 18 years. The good news is that Olathe has several unique museums & attractions and over 160 restaurants. The bad news is that most of those restaurants are national chains that you could visit anywhere. This list will help you find the interesting locally owned restaurants. Most of Olathe's shopping is strip mall and/or big box: Bass Pro, Kohl's, 2 Super Targets and 2 Super Walmarts. The largest concentrations of retail stores are east of I-35 on Santa Fe and 119th Streets. When it was built, the AMC Studio 30 Theaters with IMAX was the largest movie theater in the AMC chain. The Studio 30 now has "fork and screen" theaters for adults only where you can order a meal, snacks or beer. The AMC Studio 30 is located north of 119th Street on Strang Line Road. The tickets are slightly more expensive, but they include a credit toward the food or drink purchase. This page devoted to Olathe, Kansas is a work in progress. Please email your suggestions for more attractions and locally owned restaurants to be included. Be sure to tell me what you like best about them. For more nearby restaurants and attractions try the guide to Overland Park Restaurants. Austin's Bar & Grill is one of the few restaurants in Olathe serving a full menu until midnight and appetizers until 1 AM. I am a fan of Austin's hamburgers, which are half price on Mondays. They have a small fixings bar where you select from about a dozen topping. But the Buffalo style chicken tenders are my favorite. (913) 829-2106. Last visited in March 2019 Mom's Kitchen is a much more pleasant place to dine now that Olathe has banned smoking. Mom's has a large, diner style menu and quick service. The food is more consistent than special. Real mashed potatoes, chicken fried steak, biscuits & gravy, and big 10 ounce hamburgers. Chapala is a Mexican restaurant with bright festive decor. The menu is several pages long and has many inexpensive selections. I don't care for Chapala's salsa (which tastes like just tomato sauce), but the chips are good. I particularly like their fajitas and the "Especial Chapala" which includes several meats is the best fajitas I have ever had. Many meals are available for under $5. (913) 390-0280. Last visited in May 2017 The original Mr. Gyro's Greek Food & Pastry has been on Metcalf Avenue in Overland Park for 25 years. This is the 3rd location. For fast food, the quality of Mr. Gyro's is quite good and reasonably priced. I recommend the gyro chicken salad for $7.25 or a more traditional Greek sandwich with pita bread, gyro meat, tomatoes, onions and home made Tzatziki sauce for $5.35. The daily lunch special is a sandwich and small Greek salad for under $8. Crazy Good Eats in Olathe, Kansas opened in 2015, in the same location previously occupied by Big Bubba's Barbecue, followed by McGuire's Smokehouse. Our favorite dishes are the appetizers and house made sausages. (913) 905-2744. Last visited in March 2019 Old 56 Family Restaurant is like stepping back to 1956. It has a large, diner style menu with interesting dishes that you are unlikely to find at chain restaurants. Breakfast is served all day. Old 56 has some of the best chicken soup I have ever had and good chili. Downtown Diner is just a few blocks east of the Johnson County Courthouse in Olathe, Kansas. The restaurant was started by Rich and Sue Caines who used to operate the restaurant at the Double Nickel. The Caines did doing a lot of things right, including some great specially burgers, breakfast all day and excellent smoked meats. Family situation resulted in their selling Downtown Diner in 2018, but the food and menu are unchanged so far. (913) 764-1002. Last visited in March 2019 This is a first look at the anxiously awaited, The Peanut Olathe - the 8th location for this Kansas City bar & grill chain, which started as a speakeasy in Kansas City, Missouri in 1933. The Buffalo wings are huge and are what The Peanut is best known for. We visited The Peanut on January 8, 2019, the day after this location opened. No opening jitters were apparent. Fifty Fourth Street Grill and Bar is the only Kansas location for this Kansas City based regional chain. I've enjoyed the food during two recent visits. Although the French fries were only average, a burger was large and cooked to order. The Cabo Chicken Philly (third of a pound of thinly sliced chicken breast, topped with pepper jack cheese, bell peppers, onions, jalapenos. Shredded lettuce, pico de gallo, with a sour cream spread on a torpedo roll) is large & very good. 66061 (913) 764-0540. Last visited in February 2018 Sam's Tastee Treat began as a Tastee Freeze in 1963. The menu includes over 40 flavors of shakes, plus items as diverse as chili dogs, cheeseburgers, burritos, crab rangoon, and egg rolls. The food is fair, but except for the sundaes and malts, I really go here for the atmosphere and tradition. Cash only! Five Guys serves fresh hamburgers with no preservatives, cooked to order - not fast food! Toppings like grilled onions or mushrooms are available at no additional charge. The French fries are fresh and cooked in peanut oil. Yes, this is a chain restaurant, but I think these are some of the best hamburgers in Olathe. (913) 780-4987. 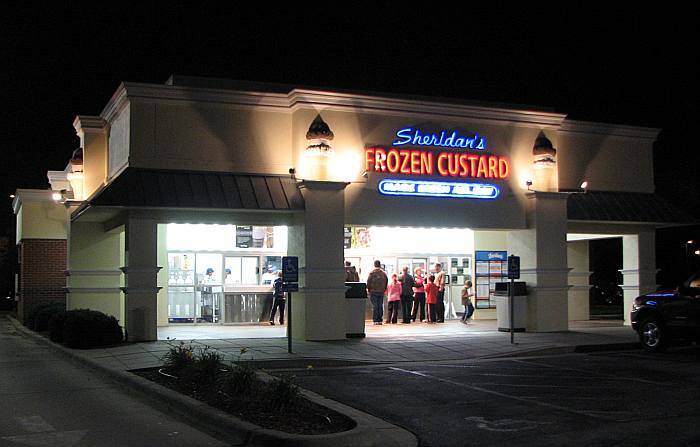 Last visited in March 2019 Sheridan's Frozen Custard started as a single popular frozen custard shop in Overland Park in 1998. Today there are 25 stores in 8 states. They use Carvel custard machines manufactured up to 50 years ago. My favorite is the butter pecan "concrete," soft custard that has had flavorings mixed in. Forest J Ackerman the inventor of the phrase "sci-fi," and former editor of Famous Monsters of Filmland, absolutely loved Sheridan's Custard. Go Chicken Go - The first Go Chicken Go was started in a Kansas City, Kansas gas station in 1969. Today there are 5 locations run by the same family including this one in Olathe, Kansas. The fried chicken is very good, but this restaurant is known for its fried chicken gizzards and hot "G-Sauce." Open until 11 PM on Friday and Saturday. (913) 780-5900. Last visited in April 2019 Smokin' Joe's B-B-Q - The daily lunch special at Smokin' Joe's is good value: $9 including tax for a large BBQ sandwich, well cooked crinkle cut French fries and soda. Or get the same deal on ribs, only on Mondays. Place your order with the friendly people at the counter and the food comes out fast. Open since 1989 - new ownership in 2019. 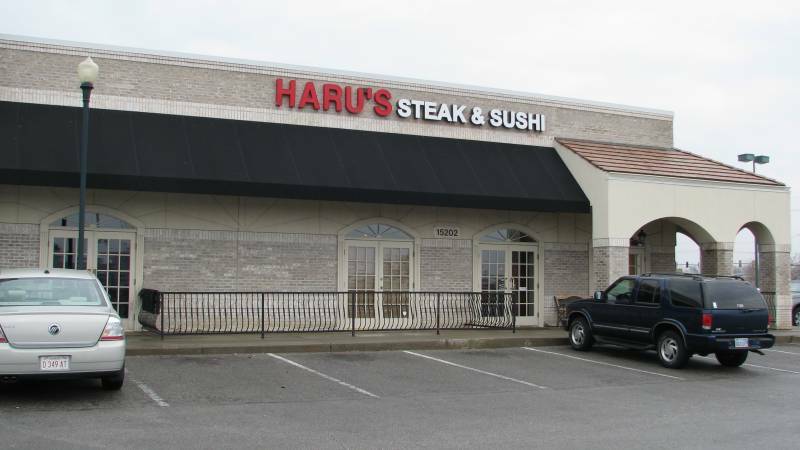 Haru's Steak Sushi Place is the oldest Japanese Restaurant in Olathe. This contemporary sushi bar and steakhouse has a $9 sushi dine in lunch special which includes soup or salad and the choice of two sushi rolls from a selection of 15. The salad has a flavorful, slightly citrus dressing with a hint of peanut. The sushi rolls which I tried, spicy crunchy crab roll and BBQ eel avocado roll were both very good. (913) 780-1118. Last visited in April 2019 Sakura Sushi Train II - Opened in May 2015. This is the second location for Sakura, which has had Sakura Japanese Restaurant in Shawnee, Kansas for many years. We have only tried this new location once so far, but enjoyed what we had and the prices for the items carried on the train are quite reasonable. Special orders are more expensive. Joe's Kansas City Bar-B-Que is the new name of Oklahoma Joe's Barbecue. This location became the second Oklahoma Joe's restaurant in 2005. The original Joe's is in a working gasoline station in Kansas City, Kansas. But the Olathe location is much larger and has a BBQ supply store across the parking lot. Joe's Kansas City Bar-B-Que, 11950 Strang Line Road, Olathe, Kansas 66062 (913) 782-6858. Last visited in April 2019 Sylas & Maddy's Homemade Ice Cream makes 150 flavors of homemade ice cream, and features 40 of them each day. I've only tried a few flavors, but have liked every one that I have tried. There are just a handful of small tables with chairs. Johnny's BBQ in Olathe, is the second Johnny's location in Johnson County. Johnny's has good specials and I think the best one is the Friday lunch special: BBQ Ribs with fries, bread, pickle, and a regular drink for $9.49. 4 ribs, which is a generous serving of meat for the price. (913) 768-0777. Last visited in May 2018 Tea Garden has a high quality lunch buffet, superior to any other Chinese restaurant I have tried in Kansas. The food turns over quickly and is always fresh and good. I am really like their appetizers: dumplings, garlic chicken wings, crab Rangoon and others. Only $9.30 including beverage and tax. The atmosphere is pleasant and the walls are lined with wonderful photos from China. The staff at Tea Garden provide good, friendly service. Jumpin' Catfish Restaurant in Olathe, Kansas serves southern home cooked meals which include family style servings of hush puppies, wedge cut or mashed potatoes, creamy coleslaw, white beans with ham, and a kosher pickle. The dining room is decorated with stuffed birds, fish & other wildlife. Jumpin' Catfish Restaurant, 1861 S Ridgeview Road, Olathe, Kansas 66062 (913) 829-3474. Last visited in May 2018 The Other Place American Sports Grill & Pizzeria is part of a small chain with 7 locations in Iowa and 2 in Johnson County. The interior is designed to reflect sound and is loud even when few people are there. The food is pretty good. The large hand breaded country fried tenderloin with gravy, real mashed potatoes and corn ($7.50) is great. The pizza is fine, but servings are small for the price. Longer review and more photos. Master Wok opened in early 2010. The prices are extremely reasonable for a restaurant with table service in an attractive setting. At lunch the menu includes 26 complete meals for $6.50 to $7.50 - complete with the choice of fried or steamed rice, the choice of egg drop or hot & sour soup and the choice of egg roll or 2 crab Rangoon. Advanced Laser Tag has a 2 story, 6,000 square foot laser tag arena with an observation deck. A new laser tag game starts every 15 minutes. Or the facility can be booked for special events such as corporate team building, church lock-ins or birthday parties. My company took all of our managers there for a competition and everyone talked about it for weeks. Advanced Laser Tag 2026 East Santa Fe - Olathe, Kansas 66062 - 913-254-9678 Indian Creek Hike/Bike Trail is almost 17 miles long, with about 6 miles in Overland Park, Kansas. The bike path is generally level and flat, but often beautiful as it follows Indian Creek through various parks. It connects to other hiking and bicycle trails in Kansas City, Missouri and Johnson County, Kansas. On the other side of Olathe, Mill Creek Streamway Park has another 17 miles of trails going all the way to the Kansas River. Bass Pro Shop opened its first Kansas City store in Olathe in February of 2007. In addition to sports equipment, hunting & fishing gear, the Olathe Bass Pro Shop has a prairie dog display, river bottom habitat and a 12,000 gallon aquarium with Kansas fish such as bass, blue gill and catfish. Seafood is available inside the store at the Islamorada Fish Company restaurant. (913) 254-5200 Johnson County Old Settlers is over 100 years old and Olathe, Kansas' biggest event of the year. The three day festival is held on the Thursday through Saturday following Labor Day. Old Settlers includes free entertainment, a carnival, children's performances, arts & crafts, auto show, and one of the largest parades in Kansas. The community looks forward to the food vendors each year and some folks just go to Old Settlers for the grange pups or walking tacos. Buddy Rogers Playhouse - The Olathe Community Theatre Association (OCTA) offers live theater productions in the former 1870 Covenant Church. The 2010-2011 season included Our Town, David's Mother and others. Tickets for all shows are $18 for adults. Some special events are less expensive. Charles 'Buddy' Rogers was born in Olathe, and their annual awards are called the Buddy Awards in his honor. Olathe Community Theatre Association 500 East Loula Street, Olathe, Kansas 66061 (913) 782-2990 Mahaffie Stagecoach Stop & Farm Historic Site in Olathe, Kansas is the only Santa Fe Trail stagecoach stop that is open to the public. There are three 19th century buildings as well as several 20th century and reconstructed buildings. Mahaffie Stagecoach Stop hosts Wild West Show & Bullwhacker Days in September, and a Christmas Open House in December. Cedar Creek Falls is formed by an overflow dam on Cedar Creek in southwest Olathe, just above Lake Olathe. There is a flow of water year around, but Cedar Creek Falls is most impressive in the spring or after a heavy rain. Lake Olathe is a 170 acre lake surrounded by a 208 acre community park dedicated in 1959. (913) 971-6263 Marra Museum of Deaf History and Deaf Culture has two exhibit halls and tells two stories. The first half of the museum is devoted to Deaf culture and the second half is devoted to the history of the Kansas School for the Deaf. The Deaf community is composed mostly of those who have been deaf since birth or very early childhood. Sign language is the first language of those people who identify with Deaf culture and community. Cedar Lake Falls is located in the spillway just below the Cedar Lake dam on the south side of Olathe. Cedar Lake is a 75 acre lake surrounded by a 54 acre community park which was originally dedicated in 1920. Cedar Lake has fishing for blue gill, black bullhead, channel catfish, crappie, green sunfish, largemouth bass, saugeye, wiper & flathead catfish. Cedar Lake Falls 15500 South Lone Elm Road, Olathe, Kansas 66061 (913) 971-6263 Olathe Memorial Cemetery has many interesting features, burials of governors from various states, and President Obama ancestors. In mid October there are evening tours, where visitors meet the ghosts of those buried in Olathe Memorial Cemetery. Visit the graves of some of Olathe's founders and meet the people who rest here as they come alive to tell their stories including Bloody Kansas and the Civil War. Christmas Card Lane is an entire subdivision of homes with extravagant Christmas decorations, tied together thematically by giant Christmas cards with greetings from each family. Over 200 hundred homes are decorated with Christmas lights and luminaries. Most cars touring Christmas Card Lane turn off their headlights and creep through the subdivision. Open evenings from Thanksgiving through New Years. Free. Christmas Card Lane North of 151st Street along Frontier Lane & Butterfield Place, west of Ridgeview Road in Olathe. Penguin Playground is a family Christmas display with nearly 150 lighted figures. Many of the figures move, some play music, and there are even penguin videos playing on the roof. This is one of the largest Christmas Displays in metropolitan Kansas City. This is a Christmas display that you will want to get out of your car and walk through. I think the Penguin Playground will blow you away. Ensor Park and Museum is a seasonal museum devoted to teacher, craftsman and amateur radio operator, Marshal Ensor. Marshall taught industrial arts in Olathe, Kansas from 1915 to 1965. The seasonal museum occupies the Ensor family farm buildings and 8 acres of the former farm. Ensor Farmsite is both a National Historic Site and on the Register of Historic Kansas Places. Ensor Park and Museum - 18995 W. 183rd Street, Olathe, Kansas 66062 (913) 592-4141 Summer Concert Series - The Olathe Parks & Recreation Department sponsors an annual series of free outdoor concerts in various Olathe locations on selected Friday evenings. Sponsored in part by the Olathe Ford RV Center, the 2019 concerts included performances by Sons of Brasil and Liverpool. Ernie Miller Nature Center and Park off Highway 7 has 3 miles of trails open for hiking from Dawn to Dusk. The 113 acre park has an outdoor amphitheater, large stream aquarium, bird feeder court with butterfly & hummingbird gardens, and other exhibits including live amphibians, turtles & snakes. Over 170 species of birds may be seen at Ernie Miller Nature Center during various seasons of the year. Ernie Miller Nature Center 909 North Highway 7, Olathe, Kansas 66061 (913) 764-7759 Olathe Veterans Memorial Park is a lovely four acre park which memorializes the men and women who served the United States in the armed services. The park has a brick walk in honor of lost submarines and park benches, but the neatest individual memorial may be the Four Chaplains Memorial, which was dedicated to 4 chaplains from the American troop transport ship, Dorchester. Welcome Home! Cowboy Boots! was a public art exhibition of 12 6 foot tall fiberglass boots that were designed and created by area artists. They were displayed during the Olathe's 2007 Sesquetennial celebration. Some of the Welcome Home! Cowboy Boots! remain on exhibit in Olathe. The Hyer-KSD Connection remains on display at the Kansas School for the Deaf at 450 East Park Street, and the Read Any Good Boots lately? boot is displayed within the Olathe Public Library at 201 East Park Street.